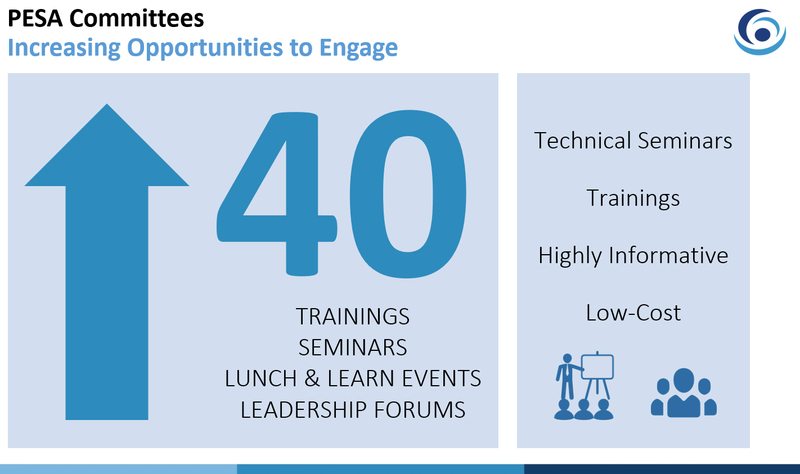 Active engagement with PESA committees is an opportunity for professionals at all levels and their companies to show thought leadership, network with other industry leaders, and gain recognition for helping improve the industry. Over the past 84 years, PESA has worked to address targeted issues and topics within the oil and gas services sector. As the needs of our membership have evolved, and in turn with the market, PESA developed a host of strategic committees to advance member priorities on key industry issues specific to the oilfield service and supply sector. Today, PESA has 15 committees dedicated to various industry segments and targeted issues that affect our sector and member companies. The committees, as well as the member company representation, have grown exponentially over the past two years. Committees hold events throughout the year, developing trainings and seminars on various topics. Committees are also focused on collaboration, jointly hosting events in order to effectively address subjects which span across industry divisions. At the PESA Annual Meeting last month, PESA President Leslie Beyer gave an update on all committee missions, goals and activities. Please click here to review the presentation slides and learn more about the current activities of all PESA committees. View the full list of committees and participating companies. If you have any questions or are interested in joining a PESA committee, please contact PESA Director of Membership Services Peggy Helfert.